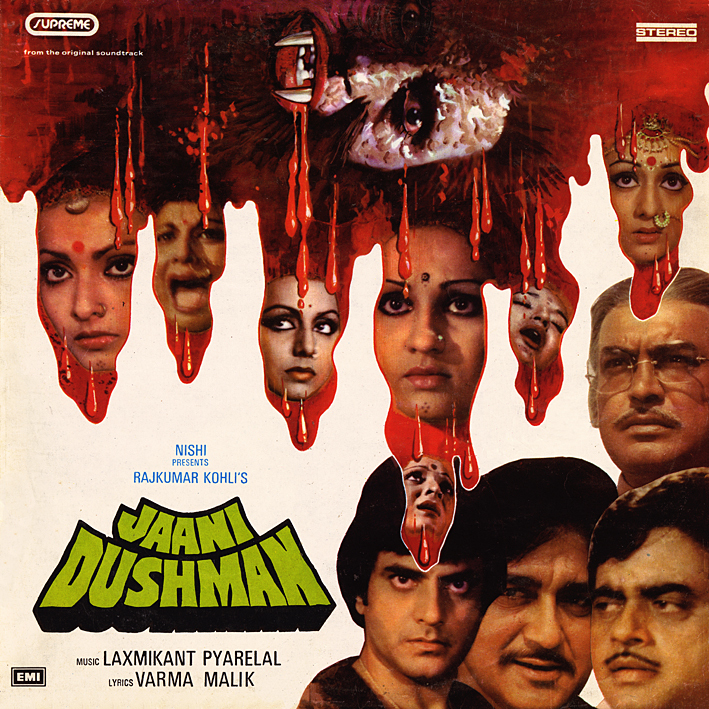 I really want to like 'Jaani Dushman' [review]. And I've played this LP a lot more times than I usually afford a record before blogging about it. Why? It's Laxmikant Pyarelal scoring a horror film; that should, in my mind, signify quality. And does it? I'm not entirely convinced. The music sounds sumptuous, from start to finish, filled with lovely, lush orchestrations. So what's missing? Drama perhaps; something (other than the great artwork) to suggest that this is a horror film. Not the clichéd big loud kettledrums, screaching violins and that sort of thing, but a sense of foreboding, tension… what Laxmikant Pyarelal so often did so well. And more memorable songs. 'Aasi Waise Na', 'Chalo Re Doli' and 'Sara Rishte' (my favourite) all make for pleasant listening, but I don't find any of them particularly attention-grabbing. A few more listens then? Oh, yeah... this album cover/movie poster is famous for being so... uhh... tasteful and modest. For a tacky werewolf flick, I think they did pretty good.